Incidentally, in this part of the world, there are many fantastic venues for you to look at which we can easily cover. So, pop down and jump inside one of our beautiful vintage motorcars and feel the luxurious craftsmanship of these wonderful icons. Sherwood forest weddings are obviously popular places to get married in Nottingham with the Robin hood legend and linking to Major Oak. These summer or winter weddings are just amazing. Getting married is a day to make wonderful and unforgettable memories. Make sure that those memories last forever when you ride in the best wedding transport from us. Imagine arriving in chauffeured luxury to a great venue like Rufford Abbey in Ollerton, that would be something to cherish and savour. According to Nottingham County Council, they have 66 licensed venues across our county so there is a good selection even for the most demanding Bride and Groom. Nottingham being in the centre of the East Midlands, You will be spoilt for wedding venues and traveling in luxury between sites is guaranteed when you are looking after your transport for your big day. There’s so much to plan when it comes to your wedding, and a big part of making it perfect is ensuring that you get your wedding car just right. The perfect bridal car should be practical, safe, stylish and reliable; and that’s an area where we believe we tick all of the boxes. With a skilled photographer and or videographer, you will always have those extra special memories recorded and safe. 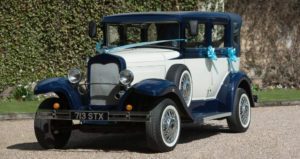 Providing classic wedding cars for hire in Nottingham to make happy couples so that they can rest assured that bridal transport is not something they are going to have to worry about on the big day. When you choose the wedding car for your day, you don’t just get a vehicle, you get a professional chauffeur. You have to understand that fully which is why all of wedding chauffeurs are extremely professional and courteous. They will always arrive ahead of schedule and dressed in appropriate, and smart attire of a suit and tie, and will treat you with the respect and the politeness that you expect to make sure your wedding is a day to remember. Every time from now on when travel in a luxury car with soft leather seats that opulent odour you breathe in will take you back to the day you got married, that’s how powerful traveling in such a car will be. There is a growing following for other vintage car the Badsworth. You have to understand the level of detail and care you put into your wedding day, and you always ensure that you put that same level into maintaining all of cars so that they are perfect for you. This means the cars will always be immaculate, reliable and comfortable so that you can sit back, relax, and enjoy your journey. 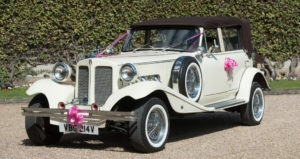 One vintage wedding car has an open top to add a little extra feeling to the transport. Weather permitting of course. The bride and the groom must discuss the colour theme they have chosen for their big day and show different samples of wedding ribbon they can customise the car with. Sometimes flowers are requested to match the bouquet and add to the setting. This also adds additional props for the wedding photographer if needed. One other extra is of course, a bottle of champagne to make a toast for the future and start the celebrations in front of friends and family. All these added together make the most memorable photos for the album or iPad! Luxury car rental market almost never encounters crises!